We have, to date, recorded two CDs. Our first, GUITARmidale, was recorded in 2005 and features music by composers who live and work locally in our home town of Armidale, NSW. 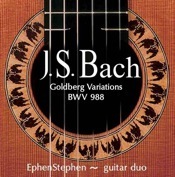 The second is our own arrangement of Bach’s ‘Goldberg’ Variations and was recorded in 2008. Both are available for purchase through iTunes, cdbaby, Amazon and many other places, as well as directly from us. There’s probably not a lot that can be added in terms of historical background and tales that surround these most famous of variations by a certain J.S.Bach. Tales and transcriptions of varying levels of height, quality and reliability abound, so what can a classical guitar duo from a small country town in Northern NSW possibly bring to the continuing history of this magnificent work? We feel that the guitar duo lends an intimacy to the work, while still referencing the immediacy of the harpsichord and the variety of tone colours enjoyed from the piano, while the blending of two guitars and two players (but one duo…) strengthens and highlights the inherent conversational character within the music. “wonderful flair and freshness…” Ann Ghandar, composer. It seems like quite a while since one Steve said to the other, “Why don’t we ask as many local composers who’d be up for it to write some music for us”? And so it happened, a little idea bringing together composers, players, instrument makers and the wider community. The idea evolved quickly from pieces for a concert, to more concerts and a CD, but one focus remained, that the whole project would be resourced locally. All the music written by local composers, the guitars made by local makers, funding provided by local businesses, individuals & other bodies, played and recorded by local musicians – there was only one name for the project that we could think of that encapsulated all these aspects into one word – GUITARmidale! 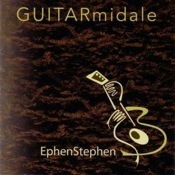 I’ll be playing music from your CD GUITARmidale on Thursday 27th December just after 4pm. You can stream the show from our website. Keep up the writing and performing and we hope to hear you live in Sydney 2013. Thank you for a wonderful CD and best wishes for the new year! As EphenStephen we’ve been pretty quiet the last year or so, but other projects have kept us quite busy. Just a word of warning, the track numbers on the back of the CD cover are wrong, there are two track 5’s, please adjust. Thanks Aaron. Apologies for the late reply but, in our defence, we had a great holiday! Best wishes to you.